So you want to track down some tractivists, huh? Here’s how! If it’s about a specific event, try the event’s page at Meetup. You can post comments there and field questions for the organizers. Are you on Facebook? Who isn’t?! Swing by our Facebook page to pin down the group admins or organizing team. Tweeting more your style? 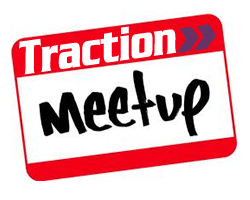 Follow Traction @gettraction. Want to contact the organizing team? Drop a line on this meetup page to send a shout out to us. Website problems? Try webmaster [at] gettraction [dot] org.